A new online game gives the public the ‘virtual power’ to determine how they would design the country’s health system. Built in partnership with Dr Mauro Laudicella at City University London, the Astellas Innovation Debate ‘My Health, My Choice’ game gives the public an opportunity to control major aspects of healthcare system design and how much they would choose to spend on healthcare in comparison to the Government’s current spending commitments. A recent public survey by Astellas Pharma Europe shows that only 24% of people think the British Government currently spends enough on healthcare. 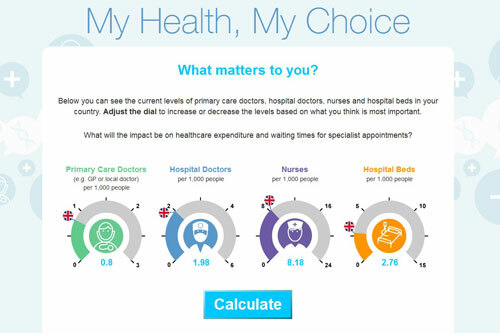 However, with the survey also demonstrating clear misconceptions among the public on how much healthcare costs, the ‘My Health, My Choice’ game has been launched to help the public better understand the complex relationships between healthcare services and costs. To allow the public an opportunity to design their own health system in response to these challenges, the ‘My Health, My Choice’ game was built using data from the Organisation for Economic Cooperation and Development (OECD). To make the game as realistic as possible, Dr Laudicella used the OECD data to model the relationship between health care inputs and expenditure in selected OECD countries. More than 100 variables were extracted from the OECD website under the chapter: Health Resources. In identifying the variables to focus on for the game, Dr Laudicella selected those with available comparable data for five countries with similar health care systems: UK, Netherlands, Italy, France and Spain. Within the game users can design their healthcare system based on a number of set criteria: the number of hospital beds, nurses, GPs and specialists in the UK. If the player chooses to amend any of the figures from the current baseline, they will be shown the impact on not only the healthcare budget, but patient waiting times for specialist appointments too. The player must then decide how any additional costs are met, from either increasing income tax, or diverting money from other government functions. Although the NHS is ranked as one of the institutions that makes people ‘most proud to be British’, 91% of responders to the Astellas survey believe that healthcare services in the UK are in need of change. In particular, shorter waiting times (36% of respondents) and improved access to medicines (30%) rank most highly as the areas in need of greatest reform. However, the same survey also revealed public misunderstanding about the true cost of care with, for example, three in ten believing that staying in hospital on a general care ward costs less than £99 per day, when the true cost is approximately £3034. The ‘My Health, My Choice’ game is designed to show users the impact of making changes to health services.